There's nothing worse than writing the perfect hook or coming up with an earth-crushing riff only for it to fly out of your head seconds later. It's at those times that you need something to record on - something small, simple to use and capable of high quality sound that can capture your moments of genius for posterity. Well, you're in luck. We've got two prizes from Olympus up for grabs that fit the bill perfectly: an LS12 recorder and its recently reviewed bigger brother, the new LS14. 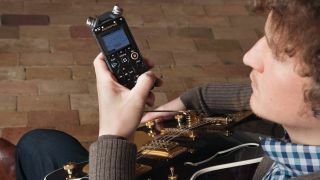 Featuring easily dialled in recording modes, two sensitive mics and handy features such as a chromatic tuner and metronome, the LS12 is a pretty handy device to have in your pocket. The LS14 meanwhile includes studio-standard recording modes, the cutting edge TRESMIC three-mic system for ultra-clear recordings, a chromatic tuner, metronome and overdubbing facilities. In other words it's a whole lot of recorder. The competition is open to UK entrants only and closes on 4 November. For more information visit the official Olympus website.